Lately I have been only eating three meals a day - and it is really hard some days, especially when I have gone for a run in the morning. Plus I need something for my daughter to snack on in between her dance classes on a Saturday morning. We had a meltdown last week when the hunger monster overtook all sense and reason (and that was just me!). So I decided to jump on the ol' bandwagon and make some raw balls. I know that most people, who converted to this way of living waaaaay before me, use fancier ingredients like medjool dates and organic produce. I have made these using the garden variety, available at the supermarket ingredients. It's more economical - which is really important for us because kids can be expensive! So, these are around 80 calories per ball. 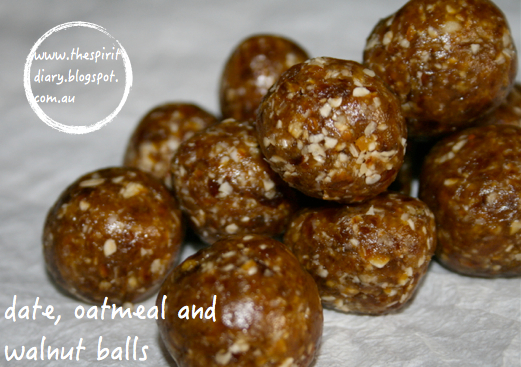 The exact calories will differ each time because you may need to add more dates (for example) to get the mixture more 'wet' so that the balls combine well and don't fall apart. So I put around 24 dates (just the normal kind), 1/3 cup of walnuts and 1/3 cup of quick oats (oats that have been ground up a little so that they cook a little faster) in the blender and blended until the mixture came together. Then I the mixture into little balls (this time I made 15, normally I would make 12) and put them in the fridge to set hard. You could vary the ingredients - try almonds instead of walnuts or try adding some coconut.